CBS San Francisco: Weather - Bay Area weather. Extended forecasts, satellite and radar imagery, live weather imagery. 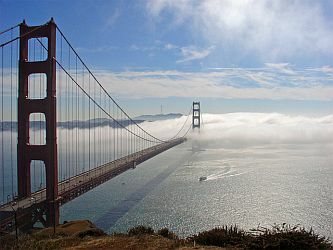 Golden Gate Weather Services - San Francisco Bay Area weather links, including climate, research, articles, reference, current weather, imagery, and meteorologist resources. Marine and Sailing Weather Links - San Francisco Bay Area marine forecasts, tides, waves, currents, winds, barometers, satellite and radar images, and Bay cams. National Weather Service Marine Forecast - Latest marine forecast for the San Francisco Bay Area. National Weather Service San Francisco - Provides weather, water, and climate data, forecasts and warnings. Also see detailed 7-day forecast and current conditions. NDBC Station 46026 - National Data Buoy Center information for San Francisco area. NOAA Tides & Currents - Comprehensive tides, currents, meteorological data for Greater San Francisco. Pacific Ocean Marine Observations - Realtime. Paul's Weather - Bay weather forecasts. Imagery and observation points. Marine forecasts, ski areas, Northern California and Bay Area forecasts and conditions. San Francisco Bay Area Climate and Weather - Climate and weather in the 10-county S.F. Bay Area region. SF Climates - Find the current temperatures, conditions, and forecasts for 17 of San Francisco's neighborhoods, from Lake Merced to the Financial District and everywhere in between. Is it warm at Baker Beach? Should I wear layers in the Mission? SF Climates displays the weather in San Francisco's microclimates on a pocket-sized map of the City. SF Gate Weather - Current conditions, marine information, live temperature, sun and moon. Spare the Air in the Bay Area - Established by the Bay Area Air Quality Management District, in 1991, to reduce air pollution and provide advance notice when a "bad air day" -a day when air quality is forecast to exceed federal standards- is likely to occur. Also see the Bay Area Five Day Air Quality Forecast. Tide Tables - NOAA tide station data and graphs for San Francisco. Predictions of the oceans tides. Usually listed are tide peak times and levels, and current direction, speed and strength. Sunrises, sunsets, moonrises, moonsets and moonphases are often included along with expected tidal data. Weather Underground: San Francisco - Forecast, local radar, local satellite, marine forecast, local allergy information. This webpage last updated on Sunday, September 10, 2017 11:37 AM.